I saw an episode of Body Cam on tv, a show that recounts officers calls caught on their body cameras. I was tremendously touched by your story and the one of your friend and colleague Officer Smarr. The bravery you displayed and courage will never be forgotten. You will always be recognized as a hero. May you forever rest in peace. One year later, we remember your service and sacrifice. Rest in peace to a true hero. 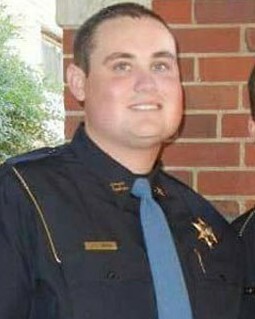 Jody's badge number was GSW 310 however he was best know as a Sumter County Deputy. Badge number SO 295, His mother "Sharron's" badge number is SO 294. Officer Smith, it's apparent from the words of respect and love in the reflections left here, that you were a very special person and a tremendous officer. Your courage, loyalty and commitment will stay alive and strong in the hearts of dedicated law enforcement officers everywhere. When I think of you, a few words come to mind: compassion and selflessness. I knew you for only a short while, but that's all any of us really have here on God's Earth. You are one of the people that make us truly better for having known someone like you. I still remember when you called me "Uncle Richard" when you visited with us years ago. Unconditional love is what you offered the world, and know that it continues to return to you even on this day. Son, you will not be forgotten and while you are no doubt with Father God, no longer worried with the meanness of this world, a part of you will continue to live here in all of us that knew you, as well as your brothers that continue to serve. Thank you for being you and to all the families and friends that have lost someone serving to protect us, thank you. I don't know you all, but may Father God continue to watch over and keep you and your families. Your sacrifice will never be forgotten. You and Nick truly are heroes and I will never forget either of you. During the manhunt for the piece of filth responsible for this I met some more of our brothers who spoke the world of you and Nick. I never met Nick but if he was your best friend then I can only imagine the caliber of person he was. I will always remember your smile and care free attitude. Even as I type this, I still hurt for your blood family. Don't worry brother we will handle it from here. Bishop State Campus Police ,Mobile,AL. This is another sad incident, my condolences to Officer Smith's parents and to his fiancée. May Jody Carl Smith soul rest in Heaven where he belongs. May Officer Nicholas Ryan Smarr soul also rest in Heaven where he too belongs. Rest In Peace Brother. Thanks for your service. Please keep an eye on those still serving. Your our guardian angel. Rest in Peace our Brother in Blue. Prayers out to all of your family, friends, and co-workers. God Bless. I am so very sorry and cannot understand all the violence in this world. You are a hero and I pray for you and your family. God bless you! Mother and mother in law of Deputy Sheriffs in Ca. End of Watch: Thursday, December 8, 2016. Grew up in the back yard with you. Gone but never forgotten and memories are forever. I have lifted your family to God every morning for over five years. I pray that Jody's life and death will bring glory to His name.